Autumn is the time of the celebration of Saint Michael’s Day retelling the myth of how Archangel Michael brandishes his sword of light and vanquishes a fearsome dragon (who represents evil or Satan). Archangel Michael is recognized in several different religions and cultures not only in Christian accounts, but also Judaic and Islam, as well as having much older roots in paganism. However, I feel the dragons that we need most to vanquish are of our own making . The Festival is a cyclical one, following the natural transition of seasons and originally held in Autumn when there is a drawing in of energy and a time to reflect and restore energy. It is a time when we sink into the darkness of the approaching Winter and go deep within to sift and sieve what we need to honour, to lose and to transform. In the Northern Hemisphere Saint Michael’s Day, Michaelmas, is celebrated on September 29th, significant to me because this, too, is my birthday. Only in recent years the full import and understanding of that connection and its influence has registered. So why talk of Autumn and dragons when here it is Spring and flowering and a time of new birth? 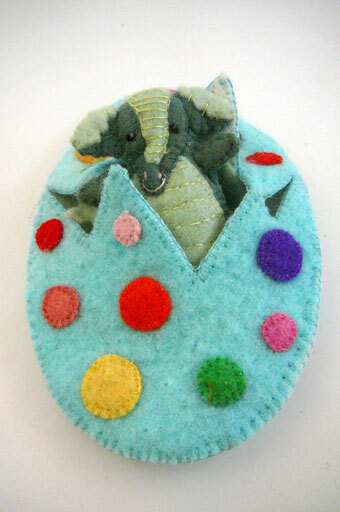 Firstly because of an invitation to link to “Our Seasons of Joy’s,” (Waldorf Wednesday Link Up, : http://ourseasonsofjoy.com ) which came at that time and also because a new little dragon has at last emerged, hatching from his rainbow egg. This project has been on the go for some time now. It has travelled to Melbourne several times, came on holiday to Port Macquarie, and has watched the dawn break over the mountains on a couple of visits to Bellingen; yet seems to have never reached finishing, in spite of constantly putting in a stitch. How long? At least a year, though the initial sketches and idea has simmered for many more. In this case the little dragon is not at all fearful but wanting an embrace. He is welcoming and wanting to be welcomed. 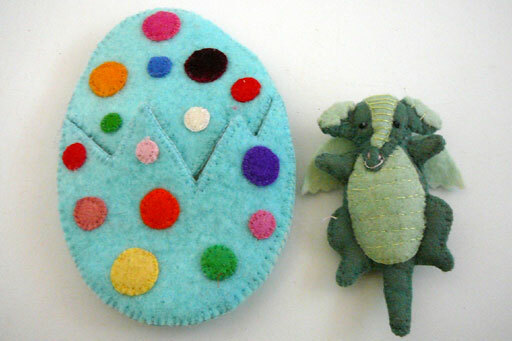 The intent was to create a friend, as well as a story prop, a counting toy, and a toy to teach colours. Another use could be to teach out and in, night and day, asleep and awake. Primarily it is a toy to develop loving and caring and kindness as well as to be used to fire the imagination, encouraging the child to tell stories . These stories can help build language skills and communication. Perhaps, too, the child will want to paint and draw dragon themes, as well as to make their own version of a dragon. Although this was designed as a learning toy it also holds a deeper message- my baby dragon wants to be embraced, wants us to welcome our shadow, greet our fears and transform them using the flame of love and light we hold within.Too often we regard some of the negative aspects of emotion as evil yet, they can be chanelled into more positive forces, for instance anger can be a powerful motivator for action to inform, to heal, to seek justice and to bring about change. What I have learnt on this dragon journey is that “dragon eggs take a very long time to hatch” and “dragon babies need a lot of nurturing”. Wow your work is amazing. Very inspirational and creative. Thankyou,- I hope very much that my work does inspire curiosity and creativity for others too. Thanks- I played!You can tell by the coloured dots,i was having fun with those and wondering if they would be fun for a child too. I want to rub his tummy. Love it for talking about colors. As we wind down in this presidential election you see that anger manifest itself it all sorts of ways, certainly some of it positive, a activator for change. I love how so much of you comes through your needle. Thankyou, kind of got a little mesmerised by the colour and dragon tale s which possibly led to much thinking. I love dragons, and I have a bunch of the stuffed/plush variety. Someday I’ll post their pix on my blog. I like you little feller. Thanks for the thoughtful (as always) commentary. Hello and Thankyou. Hope you post the picture. Have a bigger one cut out that needs to come together,cut from a gorgeous piece of hand-dyed felt that screams “I am a dragon”.I think he might be the big and blustery kind that speaks of courage and standing up for what is right. REally? thankyou for your comments. Your educational toy is so much nicer than the horrid plastic noisy things they sell at the stores. Thanks for sharing on Waldorf Wednesday. Hope to see you back this week! I know my boys would love him!